Our last day on the farm was supposed to be pretty straight-forward: Kakasii and I would make a quick run to Moshi to buy feed for the cows and chickens while Anita and Mazaa would pack up and then we’d be on our way home to Arusha. It didn’t quite work out like that, though. Just before breakfast, Kakasii got a call from our neighbor Wera. He had been cutting banana leaves to feed his cows and had severely cut his arm. He needed a ride to the hospital. Let me try to explain exactly how Wera was cutting the banana leaves so you can get a sense of how such an injury might occur: banana plants grow pretty tall so in order to cut the leaves down you must tie a very sharp knife to the end of a very long pole. Then you sorta jerk the knife to get a cut through the leaf stem. As Wera was doing that, the knife came loose from the pole and fell, hitting Wera’s arm on the way down. It’s really a blessing that he wasn’t more seriously injured. I was grateful that I had retrained in first aid when I was back in the States this spring so I felt prepared to help Wera. I was also happy we were driving our Land Cruiser which is equipped with a first aid kit (and much more useful than the zip-lock bag of band-aids and tube of antibiotic cream I had packed to have at the farm). We picked up Wera, I did what I could to treat the injury and then we took him to Moshi to the hospital to get several stitches and a tetanus shot. After our other errands in Moshi, we went back to the farm to grab a quick bite to eat, finish the packing and then headed home. 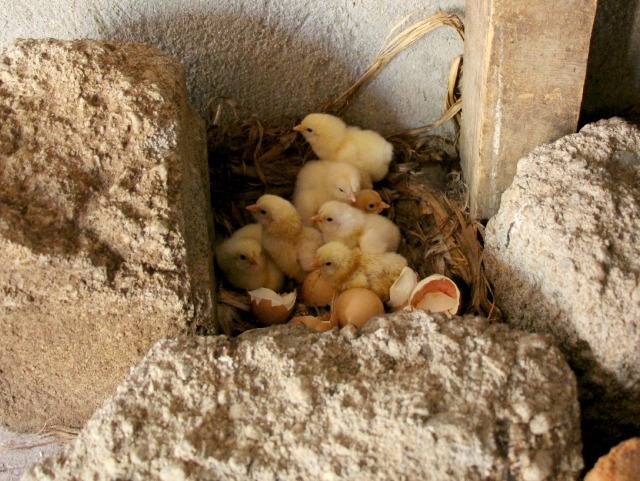 But before we left we got to see the brand new baby chicks that had hatched earlier that day.